Origin and Habitat: The native habitat of Sprekelia formosissima, long remained uncertain, but it is now known to be Mexico and Guatemala. In Mexico reports of its occurrence in the states of Chihuahua, Durango, Mexico, Jalisco, Michoacan, and Guerrero. It appears to have reached England by way of Spain, and to have become generally grown in this country about the year 1593. Altitude range: Up to 2,500 metres above sea level. Habitat and ecology: Sprekelia formosissima grows in rocky hills on cliffs and on lightly wooded slopes. Description: Sprekelia formosissima sometimes called "Aztec lily", although it is not a true lily, is a very handsome free growing bulbous plant having a roundish dark coloured bulb and annual strap-like green leaves. The exquisitely beauty, rich crimson flowers have three upper segments and three lower ones rolled into a cylinder for part of their length and looks like butterfly. It was formerly placed in the genus Amaryllis. Derivation of specific name: It is well named formosissima — most beautiful — for of all flowers that grow in a garden it is one of the most distinctive in design and colouration. Leaves: Elongate linear tapering to a point and channelled down the centre, varying from 6 to 12 mm in breadth and from 15 to 60(-110) cm in length. Inflorescence: The scape is hollow, one- or rarely two-flowered, with an acute angle on one side and ? blunt one on the other, tapering more or less towards the flower; it bears ? spathe about 7-8 cm length which surrounds the straight hollow peduncle. Bulb Bloom time: Spring where hardy, summer when grown as annual. 2) R. Hay, P. Synge "Das große Blumenbuch" Ulmer, Stuttgart, 1968. 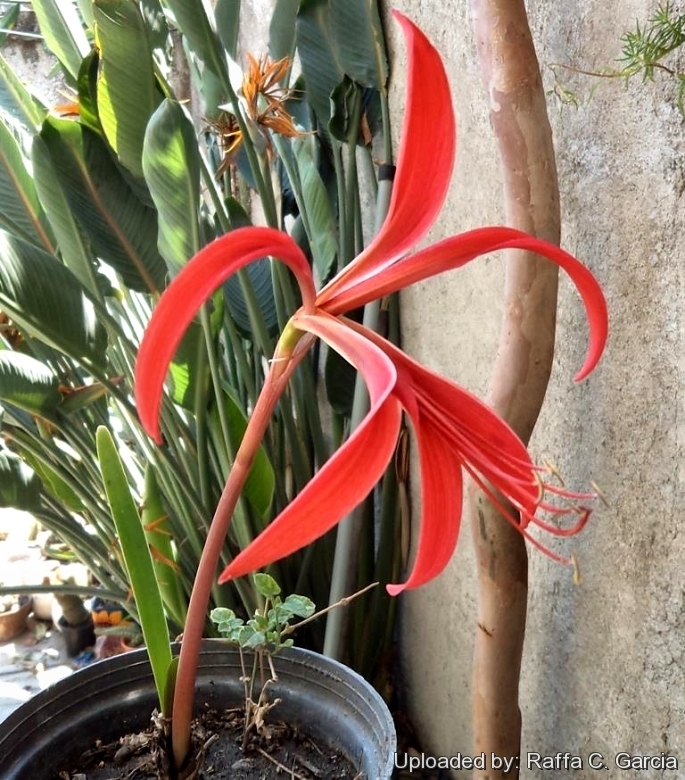 Cultivation and Propagation: The Aztec lily, Sprekelia formosissima, is a fine bulbous plant well known in cultivation and commonly sold in the seed shops. Grown like an amaryllis, which it resembles. It presents no great difficulty in cultivation. The ease of culture make it an invaluable subject for the impassioned bulb-growers. It is common in cultivation, planted in warm climates and makes an exceptional potted plant where it is as cold for it to grow outdoors year-round, or planted and lifted, much as the gladiolus. Even when well grown, bulbs often do not bloom every year. In a grouping of about a dozen bulbs, only two or three may bloom in any given year. Good garden companions: Baby's breath (Gypsophila paniculata). Its butterflylike red flowers appear from late spring to early summer. depending on your region and how much rainfall you receive. Soil: It needs a slightly acid deep, rich soil comprising equal parts of well decomposed compost, and river or silica sand (or pumice). Water: It needs to be kept almost dry during its dormancy as the bulbs is disposed to dwindle and rot. Its winter rest must be absolute. Exposure:It is most suitably grown in full sun but it will even grow and bloom in half shade too. Garden uses: In warm and temperate climates grow it sunny courtyard gardens, in raised beds . In countries with cold winter climates, they are best grown in containers in a cool or slightly heated greenhouse. Pest and diseases: Few problems. The bulbs and leaf bases are susceptible to attack by mealy bugs, and the leaf margins are chewed by snout beetles and slugs at night. Propagation: Divide small bulbs after blooming as it does not appear to produce perfect seeds. Offsets are best separated from the mother bulb straight after flowering, just as the new leaves begin to develop.